SACRAMENTO, CA (KTRK) -- He doesn't stay up for long, but he's there -- lurking in the Sacramento River. "I saw his back, but I couldn't really see too much," Amanda Great told KOVR-TV of a mysterious animal spotted wading through the California waterway in recent days. "I couldn't tell what it was." UC-Davis wildlife response specialist Scott Buhl, however, knew exactly what the mysterious critter was: a California sea lion. Not a dolphin or a porpoise or a seal, but a sea lion. 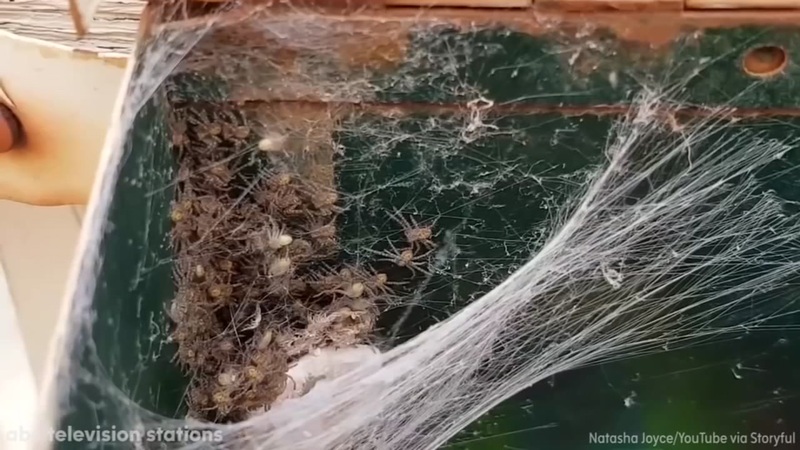 Natasha Joyce found dozens of baby Huntsman spiders in a mail box in Australia. "He was just hanging out enjoying the day and didn't seem to be in any distress," Buhl added, observing that the sea lion appears to be a healthy male who weighs between 400 and 500 pounds. Buhl says that it's not uncommon to see a sea lion once every year or two. Larger mammals -- like whales -- are much more rare. In 2007, two humpback whales got stuck in the port's shallow water and needed assistance. Several different agencies used sonar to guide the whales safely back into the bay, a journey of about 90 miles. The sea lion, however, is not in such a dire situation, but Buhl warns observers to maintain a safe distance from the creature. "They also can be dangerous, they will bite you. They are a wild animal," he advised.